The following resources have been produced by both the National 9-1-1 Education Coalition and other 9-1-1 organizations across the country. 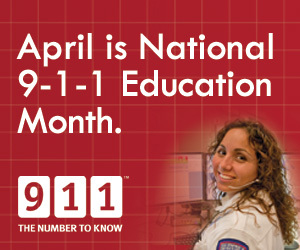 Please download and share them with your peers to help spread awareness of appropriate uses of 9-1-1 and April Education Month. Palm Beach County Emergency Management/9-1-1 Division participates in fairs, expos and special events/requests, which usually consist of having information available on tabletops and interacting with the public. Also available is a brochure that focuses on 9-1-1 and how it is evolving into NG9-1-1, as well as the importance of knowing the type of device you have (landline, wireless phone, VoIP, etc). Information is provided regarding what capabilities currently exist for 9-1-1 in terms of receiving text and video. Cell Phone Sally makes an appearance. The mascot and the accompanying video are used regularly for the K-3 age group. While the Scottsdale Police Dept. has not invested significant effort into 9-1-1 Education Month activities, the agency’s current plan is to concentrate on reaching out to the public regarding 9-1-1 education and tying in recognition of telecommunicators in the process. The Department has conducted public education efforts in collaboration with “Public Safety Day.” The Department also encourages Comm Center tours for children to demonstrate the equipment used and the process that takes place when receiving a call. Vermont’s public educator is in the process of assembling PSAs/press releases for newspaper and radio use and recently restructured its website to be updated and lively, encouraging repeat visits for new information. Vermont is also consulting with the State on protocols and with other agencies on advice for maintaining an engaging Facebook page. The page will feature regular updates on a variety of topics from 9-1-1 news to local health and safety related information. Part of the social media strategy is to foster 2-way conversations with the public. To accomplish this, the Facebook page will serve as a channel the public can use to ask questions about 9-1-1 in Vermont, share stories from the community and find out about local events. Vermont’s public educator recently joined the Safe Kids Vermont Coalition, which is the local branch of Safe Kids USA. Its participants represent a number of agencies, organizations and programs whose work is devoted to the protection, health and safety of children. The group has proved to be an excellent resource for networking, partnering, guidance and collaboration. The Enhanced 9-1-1 program has been invited to take part in several events in the coming year, with particular emphasis on events in April to promote National 9-1-1 Education Month. Two cellular telephone providers in Vermont offer Text-to-9-1-1 capabilities. The public educator collaborated on a press release about the texting features to provide outreach to the deaf, hard of hearing and speech-impaired communities in the state, and to alert the public of the availability of the service. To spread awareness of National 9-1-1 Education Month in April, the Enhanced 9-1-1 program has sponsored a National 9-1-1 Education poster contest for school-age children, with awards to be announced in early April, and submissions to be displayed online.